Penyo Stolarov graduated as an architect at the University of Architecture, Civil Engineering and Geodesy – Sofia, and defended a doctorate at the Bauhaus-Universität Weimar, where he began his scientific and teaching career. He taught at UACEG – Sofia, as well as in Universities of Applied Sciences – Stuttgart and Leipzig. Professor in the Architecture Department at New Bulgarian University, where he has been teaching since 2011. Since 2002 he has been visiting professor at the International Academy of Architecture (IAA). Since 1992 he has been a member of DOCOMOMO International to ICOMOS and in 1994 he initiated the establishment of the Bulgarian section of the organization. He is a member of the Bulgarian Architects’ Union, a member of the Chamber of Architects in Bulgaria and of the Chamber of Architects in Germany and an associate member of the Union of Bulgarian Artists – section “Monumental Arts”. 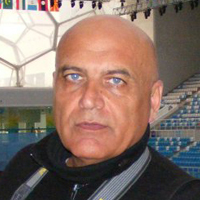 Penyo Stolarov’s research in the field of architectural design is internationally recognized and patented in Germany, Bulgaria and the United States. The prototypes of his design work are presented at international exhibitions. His work as an architect and designer is quoted and reflected in professional publications. As part of the NBU team, Penyo Stolarov creates an Academic Architecture Studio, whose goal is to meet architectural students with the high levels of professionalism in architecture.